When it was announced that there would be a Leonard Cohen tribute with the songs being sung in Irish I was instantly intrigued and immediately booked a ticket. I’m not normally a fan of other people singing Cohen’s song, however I liked the originality of this and went with an open mind to watch and listen to what would unfold on stage. I was also interested to hear Liam Ó Maonlaí singing Cohen’s songs as he has a beautiful haunting voice. Also on stage with Ó Maonlaí was Hilary Bow and The Brad Pitt Light Orchestra. There was a big screen at the back of the stage where the lyrics and images were projected to help us follow the songs in Irish. The images included photos of Cohen from his entire career and also artist impressions of the lyrics by Margaret Lonergan. The songs had been translated from English to Irish by Liam Ó Muirthile and Gabriel Rosenstock. Opening with Suzanne and Ó Maonlaí singing I was immediately impressed by everyone on stage. There was a great camaraderie between all the musicians and singers and they were all very accomplished at what they were doing. The singing of the songs was shared between Ó Maonlaí, Bow and the members of the Blake family from The Brad Pitt Light Orchestra. James Blake was standout for me with an excellent rendition of So Long Marianne. Diane Daly on violin was also very impressive and I loved her playing on Bird On The Wire and Famous Blue Raincoat. Hallelujah was the 3rd song of the night with Hilary Bow singing lead vocals. It is well-known in my circle of Cohen friends that as a rule I do not like anyone other than Cohen and Jeff Buckley singing this song. Personally I saw Bow’s performance as blending in with all the other covers, although in the better half of these covers as she does have an incredible voice and did the song justice in not going over the top with her rendition. It was interesting hearing my favourite song sung in Irish! Other songs performed in the first half included Bird on the Wire, Democracy and Diamonds In The Mine. I was especially impressed with the later which was like So Long Marianne performed by James Blake. During Everybody Knows one of the images used included a photo of the Costa Concordia and a photo of its captain which accompanied the line “Everybody knows the captain lied”. While some in the audience found this funny I personally thought it was in very bad taste and not a good idea in my opinion that it was included. I was also disappointed with Ó Maonlaí’s version of Darkness. He seemed to overdo it and I felt it didn’t fit in with how the song should be interpreted. I had mixed feelings at the interval having not liked the joke and also the version of Darkness so I was apprehensive when the second half begun. However it was to prove unfounded as I enjoyed all the songs in the second half and there was no more jokes! I was initially surprised when Ó Maonlaí had only performed a couple of songs in the first half. However such was the talent of everyone on stage I was happy that there was balance between the singers and it made for many interesting styles of singing throughout. My favourite moment of the night came during The Future when my rose photo I took of Cohen in Katowice was used as one of the images during that song. It was a great honour to see the photo on the screen for everyone to see and I made sure to tell the staff afterwards in the hope that Margaret Lonergan would hear that one of the photos she choose was taken by an audience member. Musically I loved hearing The Partisan in Irish given it is already sung in English and French by Cohen. While I of course know all the words to Cohen’s songs, it wasn’t as easy as I thought to follow them in Irish so I was grateful for the lyrics on-screen to help me translate in my mind. 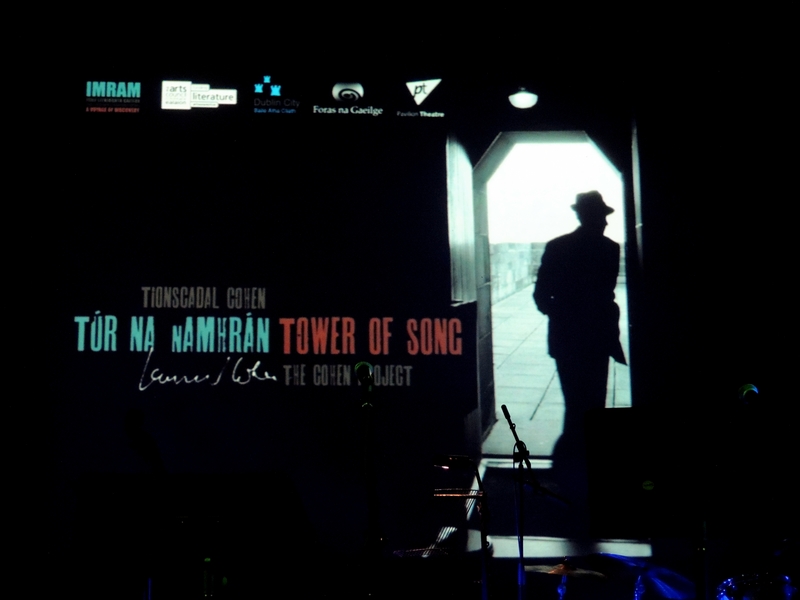 The Tower of Song was one of the highlights with everyone of stage looking happy and even had the organiser of the show dancing in the aisles! After taking a bow the band returned to position for one final song and indeed one of my favourites, Hey That’s No Way To Say Goodbye. This sounded great in Irish and I loved it as a final song. Leaving aside the couple of niggles in the first half I have to say overall it was a very enjoyable night and I loved hearing Cohen’s songs performed in Irish. Everyone on stage did a great job of honoring his songs and the backdrop where there was often images of Cohen on-screen paid him a great honour. As my Irish is almost non-existent I can’t comment to how accurate the translations were. While leaving the venue I was impressed to hear numerous conversations about the night spoken in Irish and this was from many different groups of people! Heading back to my hotel I hope that this concert won’t be a once off and that Túr Na nAmhrán: The Cohen Project returns to stage in the future. Hey That’s No Way To Say Goodbye.